You are currently browsing the tag archive for the ‘coconut mashed sweet potatoes’ tag. Hey everyone! Yesterday I made Pecan Crusted Seitan and I served with my leftover Creamy Cashew Mustard Cream Sauce and Coconut Mashed Sweet Potatoes, and Asparagus in Orange Sauce from the Mediterranean Vegan Kitchen Cookbook. This month I am sampling some dishes I want to serve on Thanksgiving. I am post likely going to serve this Pecan Crusted Seitan or a Seitan Roast for thanksgiving. And I am defiantly serving the mashed sweet potatoes and possibly the asparagus. This dinner was really good, every thing shined on the plate! I really liked the texture of the seitan, it has been one of the few successful seitans I have made. I used the recipe for the seitan cutlets from veganomicon, I just added some nooch and that’s it. The seitan cutlets had a great texture. It was so tender, I didn’t even need a knife! I think I can officially say that I like seitan! I think the only thing I would change is flavor them a bit more when I baked them probably use some herbs or something. Anyway, I then marinaded them in a simple marinade consisting of soy sauce, olive oil, lemon juice, Dijon mustard, and wine. I then breaded them in a Pecan Rosemary Panko mixture. Frying was a bit of a pain because some of the cutlets slighty burned, I don’t know why. The oil got too hot and the cutlets browned very quickly. Then, I also made mashed sweet potatoes for the first time but I gave it a little twist! I used coconut milk instead of soy milk, and wow the coconut and the sweet potatoes were amazing together! I usually just roast asparagus but I was looking for a little something new so I grabbed my Mediterranean Vegan Kitchen Cookbook and I saw this great recipe for asparagusin orange sauce. It was really simple to make just take some fresh orange juice, wine, and vegetable broth and reduce it. I boiled the asparagus and then poured the sauce over it. At the end I had an awesome meal! 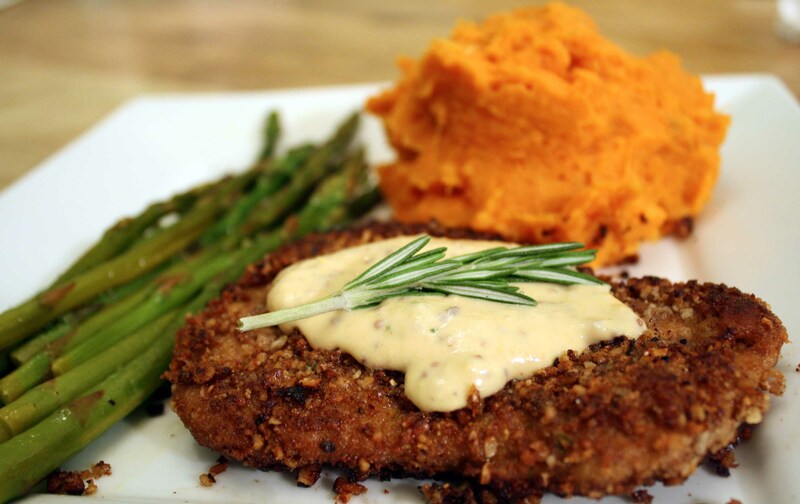 These Pecan Crusted Seitan Cutlets are awesome. They are a great main course to serve while entertaining. They would be perfect for a Holiday party! These are great served them with the Cashew Mustard Cream Sauce, but you can serve them with any sauce you wish. Mix the marinade ingredients in a bowl. Place the seitan in a small casserole dish or ziplock bag and pour the marinade over it. Marinade it for about an hour in the fridge. After one hour, start making the pecan mixture. Pour the mixture into a bowl. Dip a seitan cutlet in the marinade and then bread it with the pecans. Make sure to press the pecans well into the seitan cutlet. Repeat with all of them. Heat a pan over medium heat with oil. You need just enough oil to pan fry, you are not deep frying. Pan fry the seitan until nice and golden. The mashed Sweet Potatoes are perfect to serve anywhere where regular mashed potatoes are served. They would be perfect for Thanksgiving! Heat a pot of water. Add the sweet potatoes. Then salt them generously with salt. Bring it to a low boil. Cook until the sweet potatoes are tender. When the sweet potatoes are done drain them. Add them back to the pot. Add the maple syrup, Earth Balance, and coconut milk. Mash until nice and fluffy. Bring a pot of water to boil. Boil the asparagus for 3 minutes. Run them through cold water. Meanwhile, combine the orange juice, wine, and broth and bring it to a boil, reduce to 1/4 cup. Pour over the asparagus, and then season with salt and pepper. Today I made the Chewy Oatmeal Raisin Cookies from V’con. I will post the pictures hopefully tomorrow.